During the winter I'm all about comfort foods. Good thing I'm also all about comfortable clothes. With an abundance of soup, chili, casseroles and stew on my dinner table, I definitely need it. But it's so worth it. Stew is at the top of my list, but it has to be my mom's recipe. I've tried others before and they just don't add up, so I stick with what I know. I had never made her stew before because I thought it was just too good to replicate. I figured it took a massive amount of ingredients and a full day to prepare. I couldn't have been more wrong. The recipe is extra simple and doesn't even take too long to make. 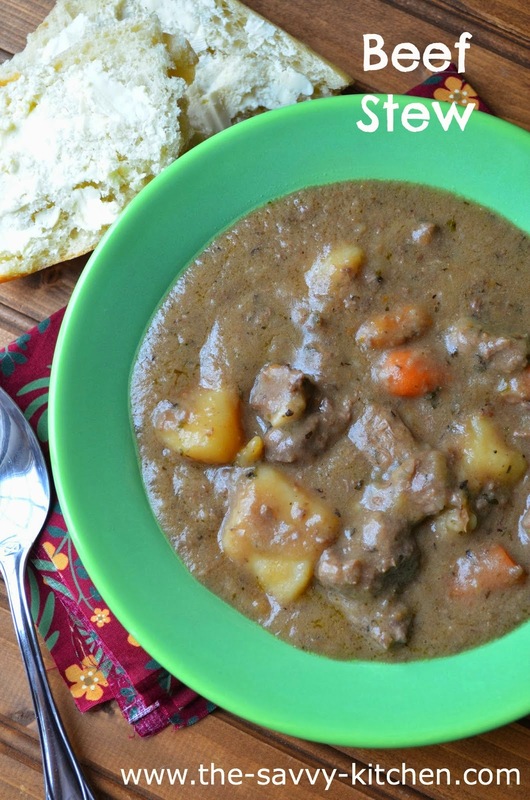 The end result is a thick and hearty stew, that just begs to be served with crusty bread. Enjoy this before Spring finally creeps up on us! Cover bottom of Dutch Oven with oil. Dredge meat in flour and shake off excess. Add meat in an even layer to the Dutch Oven and brown on all sides. You may have to do it in batches. After meat is brown, add carrots and potatoes. Pour broth/water 2 inches above contents of pot. Add onion soup mix, pepper and oregano. Cover and cook on medium heat for 1 hour or until vegetables are tender. Add Gravy Master. Heat to boiling. Mix cornstarch and 2 tbsp. water together and add to pot to thicken gravy. You can do this until you get desired consistency. To serve, put desired amount of peas on the bottom of each serving bowl and top with stew. Serve with crusty, buttered bread.